The new Cobra XRS R8 provides total protection and peace of mind with the new Super-Xtreme Range Superheterodyne Technology, detecting all 15 radar/laser bands with its super-fast lock-on detection circuitry. The unit provides maximum detection range and best possible advance warning to even the fastest of POP mode radar guns. With the IntelliLink wireless connection and versatile mounting options, the driver can mount the remote anywhere inside the vehicle for discreet operation. It's simply the best detector money can buy! With the optional GPS Locator and AURA Database upgrade your unit to alert you to verified Speed and Red Light Camera locations, dangerous intersections, and reported Speed Trap locations for entire United States and Canada (purchase and subscription necessary). Easy-to-Install, Discrete, Main Radar/Laser Detector Unit - Place the Main Radar /Laser Detector Unit behind your rear-view mirror or dash. Comes with 2 types of power cord and adhesive -backed cord clamps for easy and discrete installation. Spectre I Undetectable - Provides complete immunity to Spectre I radar detector-detectors. AURA Camera & Driving Database (w/optional GPS Locator) - GPS-based technology warns the driver of fixed speed and red light cameras, speed traps and dangerous intersections across North America. The AURA database is updated daily and provides the industry's most complete and accurate coverage and reliability. GPS Locator purchase required to receive service. Spectre Alert I/IV+ - Alerts user when they are under surveillance of Spectre I/IV+ radar detector-detectors. Frequency Display Mode - Super-fast CPU determines the frequency of the Ka radar and laser gun frequencies in nano seconds. IntelliMute Pro - Relative speed sensing auto shutdown feature will render your detector undetectable by currently available radar detector-detectors. IntelliScope (w/optional GPS Locator)- This Patent-Pending Technology provides information about the direction of Location Based Alerts relative to your moving vehicle using Global Positioning System. GPS Locator purchase required to receive this feature. Programmable Up to 1,000 Location Alerts (w/optional GPS Locator) - Add up to 1,000 location-based alerts of your choice. GPS Locator purchase required to receive this feature. Programmable Speed Alert (w/optional GPS Locator) - Provides alert when exceeding driver-preset speed limit. GPS Locator purchase required to receive this feature. Digital Speedometer (w/optional GPS Locator)- Provides accurate, current vehicle speed using Global Positioning System. GPS Locator purchase required to receive this feature. Latitude/Longitude Information (optional) - Provides accurate latitude/longitude information using Global Positioning System. GPS Locator purchase required to receive this feature. IntelliLink 2.4GHz Digital Wireless Remote System - Comes with Rechargeable Li-Ion Battery Pack, the compact Remote Display Unit/Controller brings all the controls for your Main Radar/Laser Detector Unit as well as GPS-based Locator functions to your fingertips, using IntelliLink 2.4GHz Digital Wireless Remote System (see GPS-based Locator Features below for details). The Remote Display Unit/Controller also comes with holster type bracket with interchangeable AC Vent Mounting Clip and Sunvisor Mounting Clip. S-XRS Maximum Performance Technology - New and improved Super-Xtreme Range Superheterodyne (S-XRS) detection technology, with its super-fast radar lock-on detection circuitry, provides maximum detection range and best possible advance warning to even the fastest of POP mode radar guns. Full Color ExtremeBright DataGrafix Display - 1.0" OLED display provides enhanced data display in easy-to-read vivid colors. Also allows user to select from 5 different color schemes to match dash illumination (Full Color, Blue, Orange, Green and Red). Retractable USB Power Cord with modular 12V Cigarette Lighter Plug - Recharge Li-Ion Battery for 2.4GHz Digital Wireless Display Unit/Controller in the vehicle or through USB port on the computer. Ku Band Detection - Detects Ku Band Radar Gun currently being used in Europe. Be prepared for future introduction in the U.S.
LaserEye - Provides 360-degree detection of laser signals. Voice Alert - Warns driver with specific voice annunciation of the signal being detected. VG-2 Alert Undetectable - Provides complete immunity and alerts the driver when under surveillance of VG-2 Radar-Detector-Detectors. Strobe Alert - A Cobra exclusive, works with tens of thousands of emergency vehicles currently equipped with traffic light controlling strobe emitters. Provides advance warning of the presence and/or approach of emergency vehicles. Safety Alert - Warns drivers of the presence and/or approaching emergency vehicles, railroad crossing, and road hazard locations equipped with Cobra's exclusive Safety Alert transmitters. Auto Mute - Automatically mutes the alert tone for enhanced driver convenience. IntelliMute - Relative-speed-sensing Auto Mute system that virtually eliminates false alerts. IntelliShield False Signal Rejection - 3-Level City Mode offers the best false signal rejection in both urban and rural areas. Digital Signal Strength Meter - Provides the driver with relative proximity to the target using 5-level digital signal strength meter. 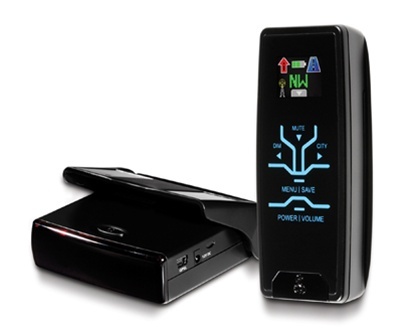 SmartPower - Automatically shuts off power to the unit when ignition is turned off. Car Battery Voltage Display - Provides graphical display of the car battery voltage and also warns the driver when it is low. City/Highway Modes - Allows the user to select operating mode, reducing the frequency of falsing in densely populated urban areas. Programmable Speed Alert - Provides alert when exceeding driver-preset speed limit. 8-Point GPS Compass (w/optional GPS Locator) - Provides accurate, 8-point directional reading using Global Positioning System. GPS Locator purchase required to receive this feature.